Joyce Chepkirui clocked 1 hour, six minutes, 19 seconds to win the Prague half marathon and in the process set a new course record. 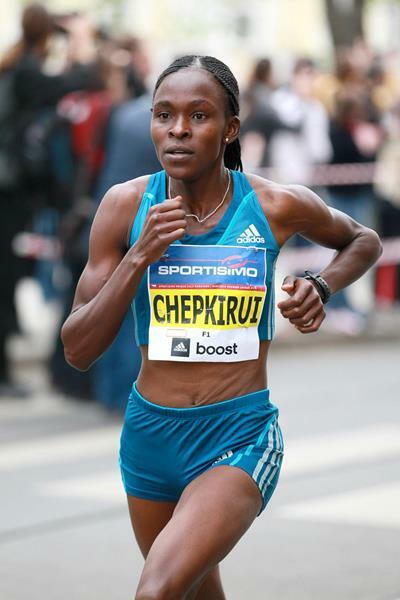 From th every beginning, Chepkirui looked like a woman on a mission. She set off on a solo run right from the starting gun and traversed the roads of the Czech capital in an unprecedented speed that broke the previous record set bt Gladys Cherono at 1:06:48. The 25 year old has represented Kenya at various events. On 23 November 2012, she anchored the Kenya team that won the Chiba Ekiden road relay. She has also won several road races recently such as the Dam tot Damloop 10 mile road race and the Berlin 10Km , both of which she won in 2013. Peter Kirui was just as dominant in the mens race as was Joyce. Halfway through the race, he made a strong move that no one else had an answer for. He wound up winning in 59:22, improving by 17 seconds his personal best time from his win in the 2011 New York City Half. This entry was posted in Kenya Athletics News, Kenya Sports news and commentary and tagged joyce chepkirui, Kenya Athletics, Peter Kirui. Bookmark the permalink.